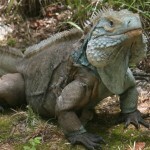 August is for the Cayman Blue Iguana, currently being helped by a captive breeding conservation program based at the botanical garden on Grand Cayman. This free-ranging one was crossing the path. Attended an informative tour of the captive breeding facilities.